Jane Fonda is an American actress, political activist, writer and former fashion model. Also, this two time academy award winner has been an great inspiration for the people. She lost her mother at the tender age of 12. She has always impressed the audience with her works. The tough situations in her life has always encouraged Jane to do something better with herself. In one of her interviews, she mentioned that individuals cannot always control their thoughts, but they can control their words, so if we keep on impressing our subconscious mind and we can master every situation. 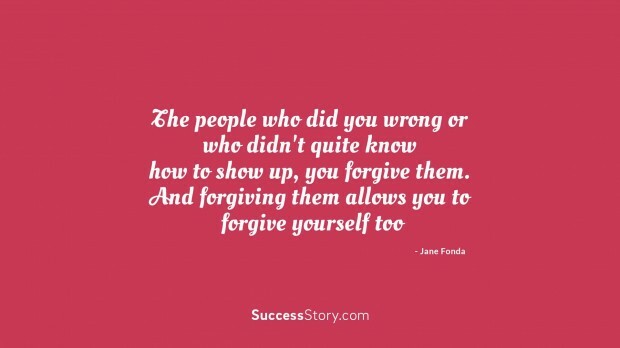 "The people who did you wrong or who didn't quite know how to show up, you forgive them. And forgiving them allows you to forgive yourself too." Furthermore, Jane Fonda workout quotes showcase that she is also an amazing fitness guru. Today she looks forward to help the teenagers, as she too had suffered a lot during her adolescence age. The tough times that Jane encountered during her teen age, allows her to understand life better. She has been doing really great as a mother and as an individual. Jane has always focused on doing things right now. Delays make things only worse. She has also been a guide for the parents. Her quotes, interviews and speeches that the parents need to do more of listening than talking. Be it Jane Fonda barefoot in the park quotes or inspirational speeches, the actress has been helping inspiriting the teens to find solutions to various questions and troubles of life through her words of wisdom. Going through her quotes is a thing of pleasure in itself. She is and will always remain a guide for people.